"Innovative, informative and intriguing—this is a unique history of urban dance, and a must-read for all concerned with cultural creativity and social networking in America." This book is a comprehensive, historical bible on the subject of urban street dance and its influence on modern dance, hip-hop, and pop culture. From Michael Jackson's unforgettable step that became known as the moonwalk, to the dance moves of today's pop stars like Usher and Justin Bieber, all aspects of modern pop dance—and consequently pop culture—are derived from the inspired, unsung heroes of an underground urban dance movement that dates back to 1967. 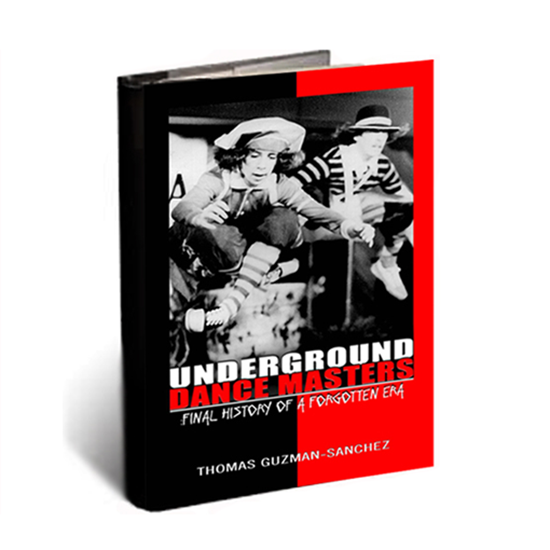 Underground Dance Masters: Final History of a Forgotten Era is a comprehensive history of urban street dance and its influence on dance, fashion, and pop culture. It is the first—as well as the definitive—history of urban dance. The book features famed director/choreographer Kenny Ortega and the collective of legendary dance masters of urban dance. The renowned groups Chain Reaction, Black Messagers AKA Mechanical Device, Electric Boogaloo, Lockers, Rock Steady Crew, Starchild La Rock, and Granny & Robotroid Inc. are recognized for their historical contributions. Urban street dance—which is now mistakenly referred to across the globe as either "break dance" or "hip-hop dance"—was born 15 years prior to the word hip hop ever existed. Unfortunately today, the dance innovators from "back in the day" have been mostly forgotten, except when choreographic echoes of their groundbreaking dance forms are repeatedly recycled in today's media. Those moves were honed by urban dancers from the late 1965 into the 90's on the streets of Reseda, South Central Los Angeles, Oakland, San Francisco, Fresno, Hollywood, the Bronx, and Brooklyn. In Underground Dance Masters, Thomas Guzman-Sanchez, a legendary urban street dancer who was not only witness but a key part of the street dance scene since 1973, sets the record straight, blowing the lid off this uniquely American dance style and culture. This text redefines what is referred to as "hip hop dance" and the origins of a worldwide dance phenomenon. It exposes for the first time the origins of the classic urban dance forms of Funk Boogaloo, Locking, Crossover Locking, Popping, Roboting, Zig-zag, Punking, Posing, Krumping and B-boying—the most important developments in dance history that directly affect today's pop culture worldwide.